Sorry for going MIA this weekend, the weather was nice so I spent some time away from my computer and enjoying the outdoors. (Plus I even went to a social event. Shocking, I know!) Now that I have a little sun burn to tide me over before the rain picks up again, it's back to the daily grind. Since it's Meatless Monday again, I thought I'd go with this nifty little instant noodle bowl I picked up at Aldi. This Fusia line at Aldi seems to be expanding. I remember when it was only frozen bags of stir-fry. Now you can buy pot stickers, egg-rolls, noodle dishes, sauces, and all kinds of nifty items. The packaging for this is very similar to other microwaveable noodle bowls that I've seen at the Asian Food Market and H-Mart. 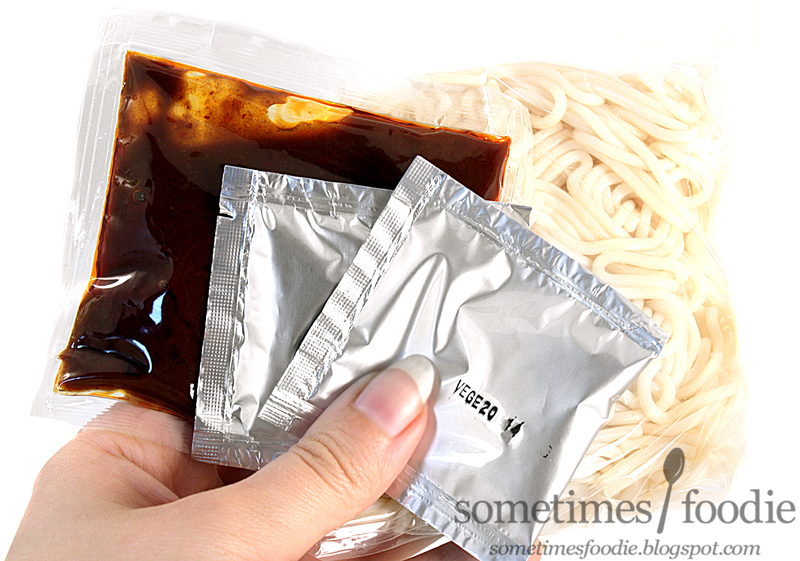 It's a cardboard sleeve holding a plastic bowl with several packets of ingredients and a handy little fork. You really have everything, including eating utensils, ready to go, just add a few tablespoons of water and boom! Instant lunch. So it's functionality is great, and it's design is pretty nice too. Out of all the instant noodle dinners I have had, which is mostly Yakisoba and various forms of Ramen, this is one of the prettiest. The images are vibrant and appetizing, the information is straight forward, and there is just a hint of texturing. I really like this layout and all of the color choices, the logo and branding seems a little...not PC? But it's a product of China, so does that make it okay? Inside the cardboard sleeve there is a plastic bowl, with a lid, wrapped in plastic. Then, inside of there, are several packets. 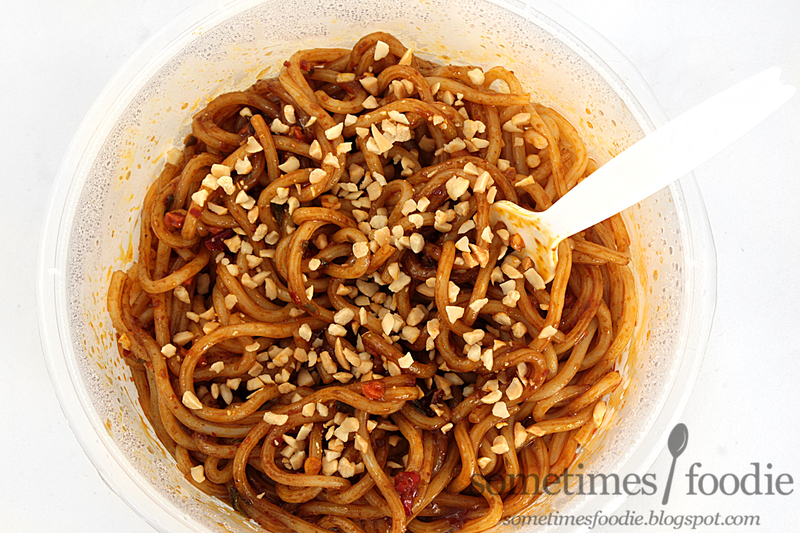 We have a pouch of partially cooked noodles, they are a bit stiff, but the have been partially cooked to allow for a fast cooking time, a sauce packet, some dried veggies, and a little packet of chopped peanuts. To cook this up all you have to do is dump everything (except the peanuts) into the bowl, add two tablespoons of water, seal everything up with the lid, and toss it into the microwave for two minutes. Super easy, like all instant noodle dishes, and it already comes with a tiny fork, which I love. It's so convenient! Once cooked I topped the noodles off with a bit of the chopped peanuts, and it was ready to eat. The cooked noodles and sauce smell sweet and spicy, like red pepper flake or a red pepper flake infused oil. I'm kind of kicking myself because I didn't take any photos of everything combined before cooking, because the sauce really gets absorbed into those noodles. Before cooking everything was drowning in sauce, now? They look more oily than saucy, but they smell pretty darn good. I took a bite, and this is really good. Definitely one of the best microwave noodle dishes I've ever had. The noodles are slightly firm, but not over cooked or dry, and the sauce has a lovely mixture of sweet, salty, smokey and spicy flavoring. Almost as if you took hoisin sauce and mixed it up with a smokey red pepper oil. The spiciness isn't overwhelming or really all that powerful, so heat seekers would be very disappointed, but as far as instant noodle dishes go, this little bit of heat enhances the rest of the flavors and keeps me coming back for more. Plus, I normally am not a fan of peanuts in my noodle dishes, but these chopped nuts add a crunchy texture that makes this just that much more enjoyable. I love this! I am definitely buying more of these for my lazy workday lunches. It's perfect, but that's because I am taking it for exactly what it is, a cheap lunch bowl. Does it compare to fresh made ones at a noodle house? No way. They are in completely different leagues. Judging this by what it is, it's fantastic. 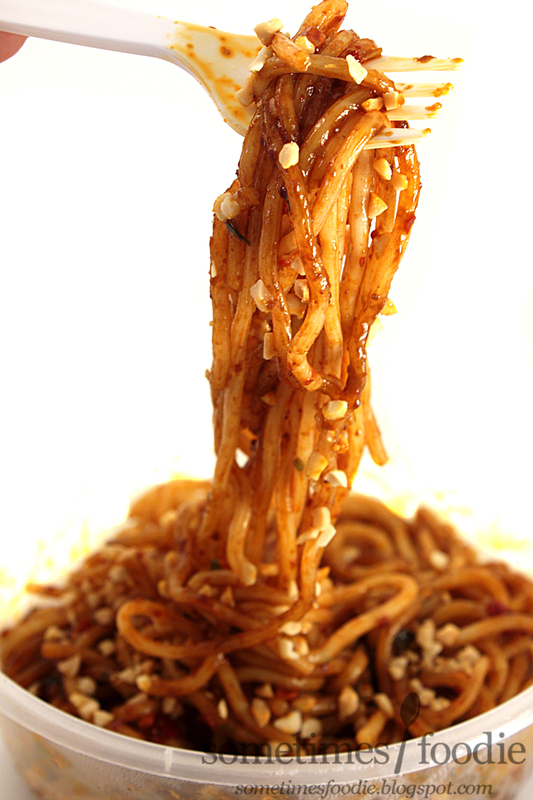 If you like Yakisoba, but wish it was less sweet and had a more complex flavor, check this out. I don't think you'll be disappointed.The only problem is that it's not always available, I have seen these bowls come and go at random, so who knows when this Aldi Unicorn item will be returning. Whenever it does, I am stocking up. Hurrah for cheap lazy work lunches! I agree 100% with this review....I cannot wait until my local Aldis gets them in stock again....I will purchase a ton of them. The soup ones were pretty "meh" but I loved this one and and sesame noodle one. It was such a warm and yummy desk lunch. 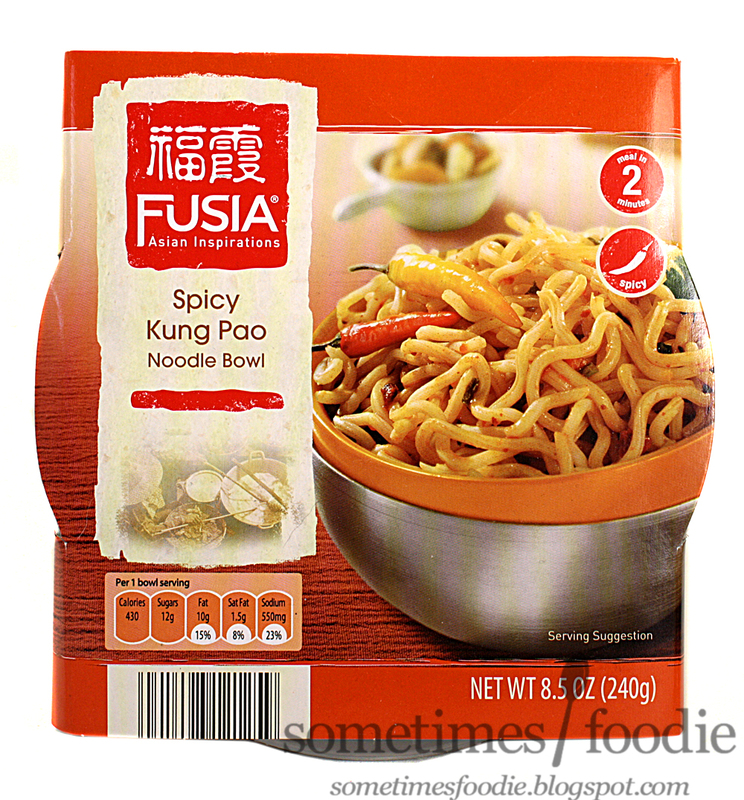 It's essentially identical to the Simply Asia Spicy Kung Pao Noodle Bowl. 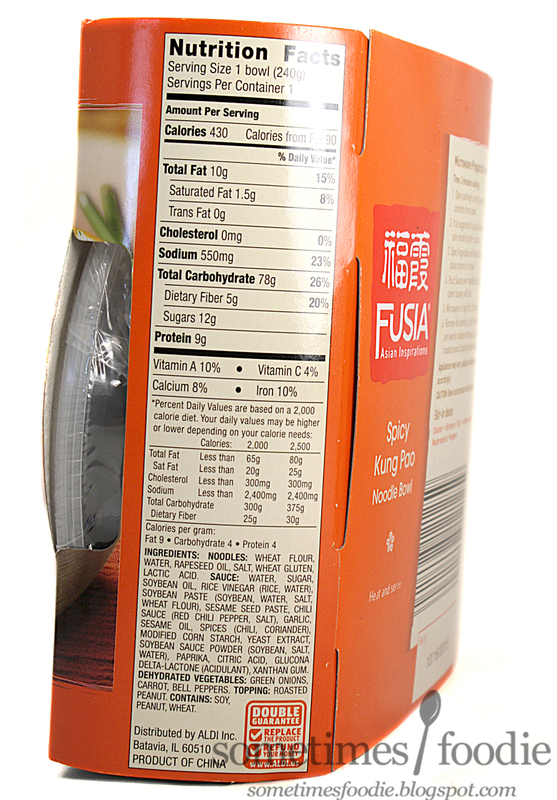 Same Nutrition Facts, same ingredients (extremely minor differences). Typical name brand price, $2.99. Typical Aldi price, $1.19. Thank you so much for spotting that! I figured it was a repackaging from another branded item but I didn't know what.